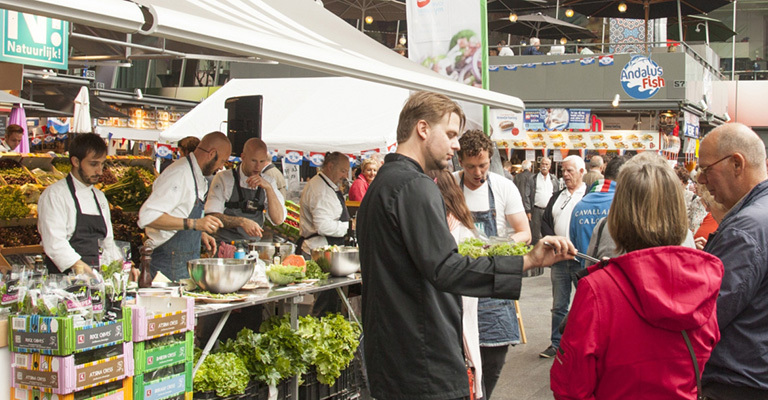 A trip to the shops ended in a new eating experience for people in The Netherlands last week, as shoppers at two Hoogvliet supermarkets could sample the delicious piel de sapo melon from ‘Share a Smile’ food trucks and enjoy a little taste of Spanish holiday flavours. The unique-looking piel de sapo is a traditional staple in the Spanish diet and known for being an essential part of a family meal where the melon is shared in salads and desserts. Piel de sapos score favourably in consumer research and Love my Salad wants to share this amazing product for consumers all around the world, rolling out an initiative called ‘Share a Smile’ that has kicked off in The Netherlands. To raise awareness of this melon, brochures with information about the piel de sapo were distributed in 68 Hoogvliet supermarkets to inform consumers about the special flavour and appearance of this melon variety. Food trucks at Hoogvliet supermarkets in Alphen a/d Rijn and Woudenberg distributed samples of piel de sapo melons to customers. Despite its unusual appearance of knobby, green and cracked skin, the white flesh inside this melon is juicy and super sweet – similar to a honeydew but even sweeter. Generally, consumers think the green colour indicates it’s not ripe, but piel de sapos in the supermarket are ready to eat and have ripeness indicators that are easy to spot. Share a Smile aims to educate consumers about this melon so everyone can add a little more sweetness to their life. In addition, an online campaign is happening via social media and the Love my Salad website, to stimulate the consumption of piel de sapos and inspire consumers with surprising recipes.